Liturgy | stuff antonia says. I sing out the words loud and open, knowing that I do so because I love Isaac Watts more than I truly understand the words. This happens to me more often than you’d think—lying in church. But this is why I keep showing up nonetheless: these lies are also prayers that one day I will be telling the truth. The cross? Wondrous because foreign. That crown? So rich because it’s unreachable. This, this is true. This at least. I know what is demanded. In these twenty-something years, the cross has held both my highest mysticism and my coldest shrug. I cry through the collects. these and other passions I know—in names I pray and on my very skin. The Passion? A distant bloodbath on just another pretty man. 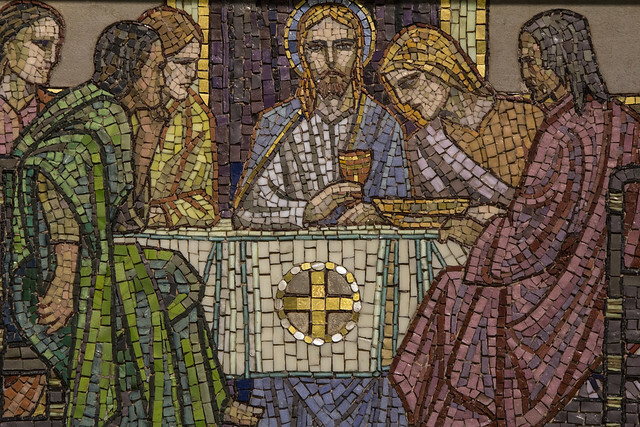 I hold the Eucharist in high regard–you would think I’ve come to terms with the Sacrifice. Each week, Body, broken for you; blood shed for you. Each week, these holy mysteries. But this day of the Holy Mystery, there is no sweetness or burn of wine, no bread, because this day is all Body, all Blood. And I’m standing a million miles away. This is the part that will sound better or worse than it was. This is the part I wish I wasn’t telling you—that I went home from that service, found an odd cigarette from some rebellious night past, and lit it on my back stoop, alone, into the night. I’m not going to pretend this smoke was sacrament, or even right, but it suddenly seemed very very important to breathe the death and guilt into my lungs on this night and watch it materialize in front of me. To flick the ash I missed on my brow almost forty days ago, to taste the darkness on my lips though the flame long extinguished, to feel the sickness coming on me like sin. Halfway through, street noises died down just long enough for me to think I hear the curtain rent in two. Tomorrow, Holy Saturday, I will plant something in my windowbox. A friend told me this is something of a tradition, that what you plant in earth on the day our Lord was in the ground is sure to grow well. This is not quite orthodoxy, but I will get dirt under my nails in fear and trembling. I will pray a small thanks for the more than small hope that my faith doesn’t require total understanding, that my belief holds more and less than my discursion. But I will plant, hoping something Good and True will rise from the dead.